There are so many events in Vancouver every month. From concerts, to dramas, to parades, polar bear swims and charity runs, Vancouver has an electric vibe and something for everyone! Canada's third largest Auto Show, and one of Western North America's premier automotive exhibition events. B.C. 's premier nine-acre amusement park filled with electrifying rides. Pacific National Exhibition Park. Canada's largest marathon takes participants from B.C. Place Stadium through False Creek to Stanley Park and the Kitsilano neighbourhood. Vancouver International Children's Festival This family festival features theatre, music, dance and puppetry from around the world. Top cowboys and cowgirls on the professional rodeo circuit compete in traditional rodeo events including bare back, saddle, bronco, and bull riding. Location: Cloverdale Rodeo and Exhibition Fairgrounds. This popular festival includes family day, May Day celebrations, an anvil salute, an antique fair, fireworks and a parade. EAT! Vancouver, The Everything Food & Cooking Festival. Come to B.C. Place and experience EAT! Vancouver. This event encompasses unique food experiences, opportunities to learn behind-the-scenes culinary magic from professional chefs, dynamic entertainment through celebrity chef cooking demonstrations and intense culinary competitions, interactive cooking activities for kids, cookbook signings, and fantastic shopping and tasting opportunities. Favourite Shakespeare plays (The Taming of the Shrew, Romeo & Juliet, Julius Caesar, and Timon of Athens) are performed in tents on the beach overlooking picturesque English Bay. Celebrated throughout the month of June. The events range from arts and culture to sporting activities, picnics, dances and more. One of the most acclaimed cultural rendezvous in French. This festival reflects the multicultural character of the international Francophonie, which includes more than 40 countries around the world having French as one of their official languages. It happens in the purest traditional forms of Francophone summer festivals, with exterior stages set up in the heart of the city. Take in a weekend of racing and cultural activities. Highlights include stage entertainment for the whole family. TD Canada Trust International Jazz Festival. Some of the biggest names in jazz take the stage at 40 venues in the Vancouver area. In addition, a free, two-day New Orleans-style street festival is held in historic Gastown and at the Roundhouse Community Centre. Presented by the Coastal Jazz & Blues Society. Scotiabank Vancouver Half-Marathon & 5K. 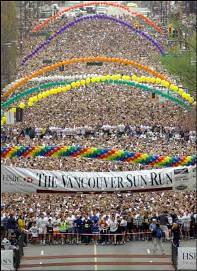 The world's most scenic Half-Marathon and 5k from UBC to Stanley Park. A perfect time of year for running and vacationing in Vancouver. Join 5000 runners for the best Half-Marathon you can run. On-line registration. Celebrate the country's confederation day with entertainment for the whole family, featuring songs and dancing. Canada Day at Granville Island. Bring the whole family for an all-day celebration with interactive displays and games. Dancing on the Edge Festival. Vancouver's ten-day dance festival features dance works from across Canada and the U.S.A.
All over the Map on Granville Island. FREE world dance performances on the outdoor stage at Performance Works, on Granville Island. All shows are family-friendly and are guaranteed to get you moving, so bring your dancing shoes! Sundays at 2pm. Music in the Garden: Enchanted Evenings Series. Evening musical performances featuring classical, Asian, world, Indian and fusion music. Location: Dr. Sun Yat-Sen Classical Chinese Garden. Music from local and international folk singers, songwriters, musicians, and storytellers. Daytime and evening performances and special children's programs. Location: Jericho Beach Park and various venues. Come and enjoy one of Vancouver's favourite summer traditions Theatre Under the Stars at Malkin Bowl in Stanley Park! This summer, two musical favourites will delight the whole family GREASE and OKLAHOMA! Canada's top men and women cyclists take on North America's best on a thrilling 1km criterium course in historic Gastown. Everyone welcome. Free admission. Location: Water Street in Gastown, Start/Finish at Steamclock. Three competing countries will try to amaze us all with a spectacular display of fireworks in this international competition. Each July, the Trinidad & Tobago Cultural Society of BC presents the Caribbean Days Festival. This event draws a crowd of exuberant fun-lovers to North Vancouver's Waterfront Park for a weekend of parading, dining and dancing in the sunshine. We invite you to come out and celebrate the vibrant life and diversity of the Vancouver queer community. A summer music festival featuring national and international artists performing orchestral, choral, world and chamber music, jazz and opera in over 50 concerts. A fascinating exhibition of planes and demonstrations of stunt and technical flying. 19th Annual Queer Film Festival. Promotes the production and exhibition of films and videos of interest to the lesbian, bisexual, trans and gay communities in British Columbia. More than one hundred groups from around the world present 500 shows on a variety of indoor and outdoor stages. A public celebration of comedy and laughter, this festival features an eclectic and diverse mixture of comic artists from around the world. Location: Granville Island and various other venues. Mid-Autumn Moon Festival at Dr. Sun Yat-Sen. This is the most romantic outdoor Chinese cultural celebration and includes a colourful lantern festival, myth telling, music, and complimentary tea and mooncakes. This festival presents 300 films from 50 countries making it one of the largest film festivals in North America.,br> Location: Granville Theatre and various other venues. The Word on the Street Festival. You and your family are invited to celebrate the joy of reading at The Word On The Street Book & Magazine Fair Library Square. The Stanley Park Halloween Ghost Train. Vancouver's autumn must-see and must-do family event. Thousands of passengers show up at the Ghost Train each October to experience a thrilling ride deep into the heart of the forest. This festival presents 300 films from 50 countries making it one of the largest film festivals in North America. Location: Granville Theatre and various other venues. Vancouver's multiculturalism is reflected in this burgeoning film festival highlighting the work of Asian filmmakers from around the world. 4th Annual Rogers Santa Claus Parade. Parade Route through downtown Vancouver. The Rogers Santa Claus Parade will attraction more than 50 different bands, floats, and community groups. Great family fun. Peak of Christmas at Grouse Mountain. Bring your family to Santa's Workshop and meet reindeer, or take a sleigh ride through our mystical alpine forest. You can also experience the tranquil beauty of skating on our 8,000 square foot mountaintop Ice Skating Pond, surrounded by snow-topped trees. Festival of Lights VanDusen Botanical Gardens. The central acres of VanDusen Gardens are transformed into a holiday magic land with seasonal displays and over 20,000 twinkling lights. Boat owners from around Greater Vancouver decorate their vessels and cruise around the waters of Vancouver Harbour. Bright Nights" in Stanley Park. The Vancouver Parks Board and the B.C. Professional Fire Fighters' Burn Fund have together created nights of magic and illumination in the middle of wondrous Stanley Park.